Chavez To Decide Whether To Return To Cuba For Chemo In "Next Hours"
DOW JONES NEWSWIRES. CARACAS -(Dow Jones)- Venezuelan President Hugo Chavez said early Friday that he would be making the decision "in the next hours" whether to return to Cuba for a second round of chemotherapy or remain at home for the treatment. Chavez, who made his comments during a telephone call to a state television program, said he would be meeting with his team of Cuban and Venezuelan doctors on Friday to set the location of his continuing treatment for cancer. "That decision will be made in the next hours and in any case that second phase (of chemotherapy) will also begin in the next hours," he said. 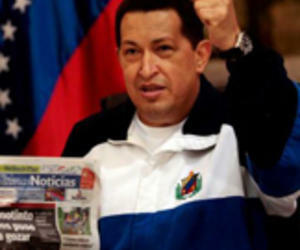 Even with Chavez's own statement, it is hard to predict the flamboyant leader's coming course of action. While seeking treatment in Havana for a type of cancer that he has refused to identify, Chavez has made several abrupt exits and arrivals between Cuba and Venezuela with very little notice and, at times, completely unannounced to the public. If the decision is made to return to Havana, Chavez could leave Venezuela as soon as late Friday or early Saturday, according to the vague timetable he offered with his latest comments. On Friday, Chavez was cautious about how much information to reveal about his illness, saying that he would not identify his medical team. Critics and political opponents of Chavez have demanded more complete disclosure about his illness and prognosis, saying that the president's health is a matter of national concern. Chavez has made an effort in recent weeks to maintain a visible public profile and has begun each day with a message posted on his Twitter account and made several television appearances. During his June stay in Havana, speculation over Chavez's health was stirred by a period in which the normally media-saturating leader withdrew from the public eye. Chavez has said he had a baseball-sized tumor removed during surgery on June 20 in Havana. He also returned to the Caribbean island for the first stage of chemotherapy. Chavez says that recent medical tests have shown that his body is free of "malignant cells" after the removal of the cancerous growth but that he is undergoing chemotherapy nonetheless as a precaution.